These days I am far more likely to be found at a vaguely prog gig than a metal one. 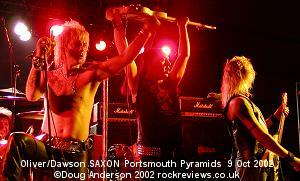 Ten to fifteen years ago it was a different matter though and last night I relived that experience in Portsmouth. 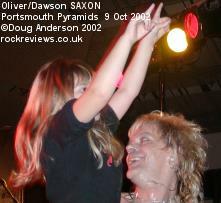 I've heard stories of the rift between various members of Saxon so wasn't really expecting too much of Oliver/Dawson's version despite the presence of two named (Graham Oliver - guitar and Steve Dawson - bass) original members plus a more recent one, drummer Nigel Durham. Opening their set with 'Power and the Glory', title track of their first deviation from their N.O.W.B.H.M. roots was a brave move and hampered by the guitar sound initially. Half the band looking like a teased hair glam group didn't help allay my fears but by the second number the audience were on their side, singing along and punching the air. What was more surprising was that probably half the audience were early twenties or under and they were into the music as much as those of us that grew up with it. By the time '747 (Strangers in the Night)' blasted forth it seemed that the whole hall was rocking to the music. 'Dallas 1PM and 'The Eagle has Landed' slowed things down a touch mid set but the double barreled closing salvo of 'Princess of the Night' and 'Wheels of Steel' proved that you don't need Biff Byford present for the songs to shine. While vocalist Wardi doesn't sound much like Biff, handling the song in a more straightforward rock manner, his working of the crowd was at least as successful as he jumped down into the gap between stage and barrier to shake hands with the pumped up front rows. He even held probably the youngest fan of the evening, a five year old girl who had been punching the air while sat on her fathers shoulders, up for the audience to see. 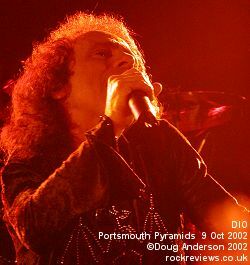 If a support band is there to warm an audience up for the main act I think it is safe to say Dio's audience were red hot for the main attraction. With half an hour to recover the crowd pushed forward leaving little room for those of us near the front. As soon as the lights dimmed a chorus of "Dio, Dio, …" welcomed the band as they opened with the throbbing title track of the latest album 'Killing the Dragon'. From the off hands were raised in familiar homage to Ronnie James, middle two fingers held flat against the palm while the outer two were raised to ward of the 'evil eye' - a typical Dio concert. With a rich musical history to plunder the band stepped back to 1984 and their second album for 'Egypt' and further still to the days before Ronnie was a solo artist with Black Sabbath's 'Children of the Sea'. The latter featured the first stylishly long guitar solo of the evening from relative newcomer to the ranks, Doug Aldrich. Though the front of house sound was fine it was obvious from the gestures the monitor mixer was being directed that onstage matters were different. We the audience didn't suffer but I wouldn't have liked to be the soundman after the show. Not to be outdone by the support act Ronnie stepped down into the gap between stage and audience to shake hands during 'Push'. Simon Wright's drum solo followed and it had to be the low spot of the evening. Not content with a couple of minutes thumping everything in sight he then entered into a long Cozy Powell style pound along to a classical backing tape. One or other would have been OK but not both. Thankfully the chance to 'Stand Up and Shout' before getting down to some 'Rock 'n' Roll' for the classic 'Don't Talk to Strangers' helped us forgive or forget the intrusion. A rather cheeky Ronnie then claimed the next song was so old he didn't remember the name of the band that wrote it. Luckily a fellow member of that band, reasonably healthy looking bass player Jimmy Bain, was on hand to remind him that Rainbow created the 'Man on the Silver Mountain'. One anthem moved via another guitar solo to the foot stomping and air punching 'Long Live Rock'n'Roll' from the follow-up album. 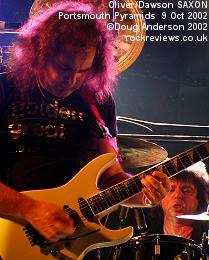 A duo from the acclaimed Magika album brought things back to the new Millennium before the band crunched into the home straight with four classics from early eighties beginning with one of Dio's strongest songs, 'Holy Diver', and finishing the set with both the bands and fans anthem - 'We Rock'. Before that fitting climax both Graham Oliver and Wardi joined the band for 'Rainbow in the Dark' as it was the last night of the tour. Judging by the smiles on faces as people left the hall I wasn't alone in thinking this show one of the best and most powerful I've seen this year. And they say live music is dead. Long Live live Rock'n'Roll! 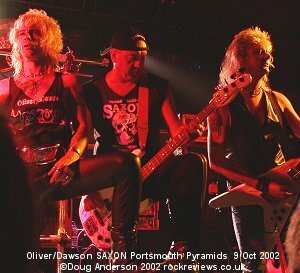 "DIO INVITES OLIVER/DAWSON SAXON MEMBERS ON STAGE: Press Release: Oliver/Dawson Saxon have been appearing a special guests to Dio on their recent UK tour, and on the last night, at Portsmouth Pyramids, a special event took place. 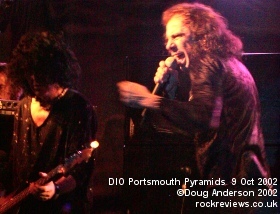 Dio personally asked Graham Oliver to come onto stage and perform Rainbow in The Dark as the final encore. 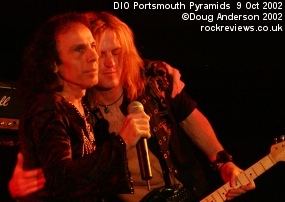 As they started playing, Wardi (vocalist with Oliver/Dawson Saxon) made his way to the front of the audience, and Dio pulled him up on stage. The occasion had added meaning for Graham Oliver. Dio performed at Manchester with Rainbow on October 6th 1976, where Graham went to see him perform. The very next day Graham had his accident, where he lost his finger, and was told that he would never play guitar again. 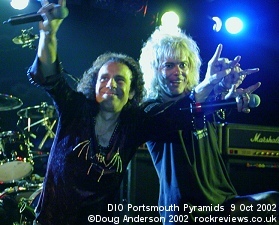 That prophesy did not come true, as is apparent, but what was strange was that the fact that in 2002, the date that Dio performed in Manchester with Oliver/Dawson Saxon was October 6th! So Graham was performing on stage with his hero exactly to the day that he was told that he would never play again." One fact is slightly incorrect: Wardi was already at the front for during the track before Rainbow in the Dark. I know as he and his girlfriend squeezed past me to get there. This page is Copyright © Doug Anderson 2000 - 2002. Created: 25 Apr 2002. Last updated: 19 October, 2002.